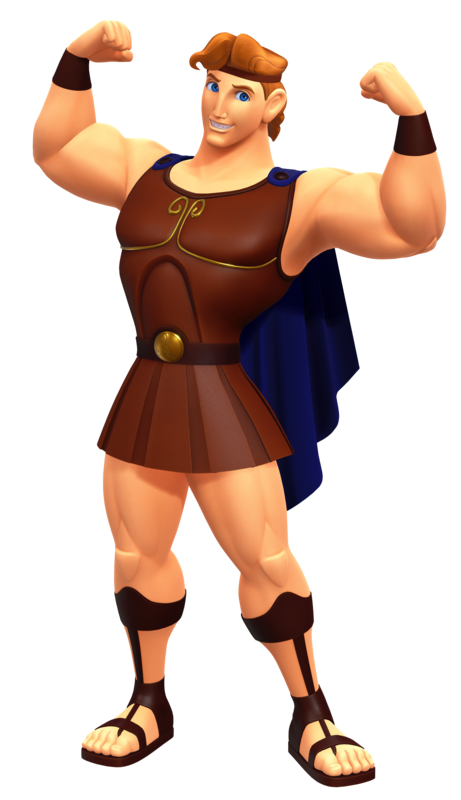 Hercules is shown to have a caring and kind personality. He is the son of Zeus and Hera, granting him god-like strength, despite not being a god himself. He has unwavering dedication that is clearly seen through his patience with his hero trainer; Phil. Hercules is regarded as the epitome of heroism. Hercules first rushes onto the scene when Cerberus is unleashed upon the Coliseum by Hades. Hercules tells Phil to get Sora, Donald, and Goofy out of the Coliseum. Sora, Donald, and Goofy return shortly to defeat Cerberus and allow Hercules to take Cloud (who is now unconscious) to a safe place. Once Cerberus is defeated Hercules convinces a stubborn Phil to dub the trio ‘Junior Heroes'. When Sora and company leave, Hercules - not wanting to discourage the three - reveals that he had substantially weakened Cerberus down before they came to defeat Cerberus. During Sora's second visit to Olympus Coliseum you have a chance to defeat Hercules in the Hercules Cup. After defeating Hercules, Sora realizes that his heart's strength comes from his friends and that that realization is what it takes to become a true hero. Hercules backs Sora up on this realization and cuts off Phil despite his protests. Hercules is the son of Zeus, king of the gods, who lost his god-status soon after being born. Still graced with powers and stamina far beyond that of a regular mortal, Hercules sought out to become a Hero, and sought out help from Philoctetes, the legendary Hero trainer. 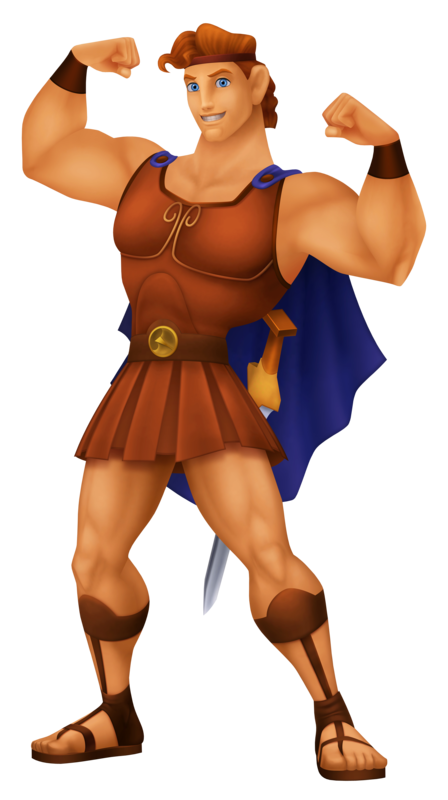 He achieved that goal and as a Hero to many, Hercules performs regularly in the Coliseum, defeating powerful opponents one after the other. Being a Hero eventually takes its toll on Hercules, and he becomes worn out, both physically and mentally. Push comes to shove when in order to save Meg who's been kidnapped by Hades, Hercules abandons the Coliseum with a Hydra he didn't finish off still present. When they return to find the Coliseum in ruins, it's more than Hercules can take and he takes the blame all on himself. He recovers his Hero spirit when Hades puts Meg in danger yet again, and Hercules rushes to save her without regard to his own safety. A Hero's worth is measured by the strength of his Heart, something that shone through when Hercules was willing to sacrifice himself to save the woman he loves. A legendary true hero, Hercules is the demigod son of Zeus and Hera and spends much of his time protecting Olympus from the monsters of the Underworld. Despite his formidable strength and battle experience, he is humble enough to continue training with Phil as everybody counts on him to be strong. The expectations Hercules is forced to live up to makes Roxas wonder whether such expectations are the same as orders. For much of his visits in this world, Roxas is mistaken for Hercules's new apprentice candidate until Hercules reveals that the apprentice should not have arrived yet. Not one to rest on his laurels, Hercules would still continue training, with or without an apprentice. The son of Zeus, ruler of Olympus, he was kidnapped as an infant and turned mortal, although he still retains his godly strength. Until he can prove himself to be a true hero, he will not be able to reunite with his parents and return home. Hercules has enlisted the help of Philoctetes, working himself to the bone and training every waking moment in order to achieve his goals. He is kind and gentle, and doesn't hesitate when a friend is in need. When Ven arrived in Olympus, Hercules was in the middle of his training with Phil, and just finished registering for the Games. He would soon find himself in a rivalry with a new trainee, Zack, who had traveled far and wide in search of Phil, drawn by his reputation of creating heroes from zeroes. The two of them clashed in the Games, and when the time came to choose between winning the battle and helping Ven, Herc dashed off towards his friend without a second thought. It was Herc who introduced Terra to the Coliseum. He encountered a swarm of Unversed in the town near Thebes, and found himself overwhelmed by their numbers. The enemies were quickly dispatched by the Keyblade wielder. Upon seeing his strength, Hercules invited him to check out the Coliseum, perhaps entering the Games as well. Hercules first met Aqua when she arrived, coming aid her in battle when she was swarmed by Unversed. He seemed puzzled at Phil's strange behavior towards the girl, but became elated when he found that not only was she familiar with Terra, but that she would also face Zack in the current tournament. Unfortunately for him, Phil decided to send him off training as the battles went on. Taking Aqua's advice about becoming a hero to heart, he continues to strive towards his dreams. A zero who went to a hero. Pain and Panic were tasked with killing Hercules when he was just a baby, but failed and turned him mortal instead. Hercules, however, kept his super strength. Having trained under Philoctetes, Hercules has become a True Hero when he saved Megara from death. His real strength is put to the test when his father, Zeus, is targeted by Hades during his assault on Olympus. Teaming up with Sora, Donald, and Goofy, Hercules puts his friends and family first to put an end to the God of the Underworld's plan once and for all.